Philips 65POS9603 4K OLED hands-on hands on review | What Hi-Fi? Philips has revealed its new flagship TV – this 65in OLED 9 series. 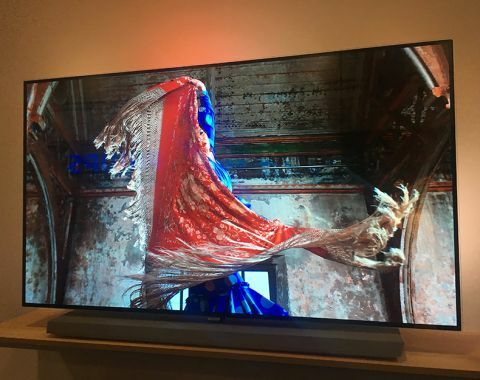 Not to be confused with the existing 9002 OLED range, the 9 series, or 9603, sits right at the top as Philips’s new flagship Ultra HD 4K television. We took a closer look at this brand new Philips OLED TV. The 65in 9603 (full model name 65POS9603) has the triple whammy of 4K OLED, three-sided Ambilight and Philips’s new P5 picture processing engine – a combination that proposes to deliver Philips’s best OLED screen yet. Powered by the P5 processor, the 65in Philips OLED can deliver a peak light output of 900nits and 99 per cent of the DCI-P3 wide colour gamut. Those numbers mean the TV has been given UHD Premium certification. It supports High Dynamic Range (HDR) as well, but only the standard HDR10 format. Philips hasn’t felt the need to implement Dolby Vision HDR, nor has it joined Samsung and Panasonic for the HDR10+ variant either. The 65in OLED comes with three-sided Ambilight, a Philips technology that extends the on-screen colours beyond the screen using tiny LEDs behind the TV. And while it may not be everyone's cup of tea, we rather like its immersive effect. We’ve also found it looks more engaging and natural on Philips’ OLEDs compared to the company's LCD screens. The interface is powered by Android TV OS, so expect to see the usual complement of Google Play, Netflix and Amazon Prime Video apps, as well as catch-up TV services for the UK. Next year’s Android Nougat update (around mid-2018) will also bring Google Assistant voice control to the Philips TV. What looks like a large, fabric-covered TV stand is actually a 6.1 sound system. We know Philips takes special notice of how its top-of-the-range TVs sound – the 55POS901F comes with an integrated soundbar, as does the new 8602 quantum dot LCD TV – but this promises to be a far more substantial boost. It’s essentially a soundbase. Not too bulky but not too slim, the base spans nearly the length of the TV, and houses six front-firing drivers and a back-firing 'triple ring' driver with a bass port and a claimed 60W output. We sadly didn’t get to hear it, but we can’t help but have high hopes. It looks like a clever and elegant solution to getting robust sound from slim screens, assuming you don't want to add a surround sound system. The premium aspect of this Philips 65POS9603 TV is further emphasised by its design: the sleek aluminium housing, which is also covered in a fetching grey cloth from Danish textile establishment Kvadrat. (Kvadrat, incidentally, is the same premium fabric that Bang & Olufsen uses for its BeoSound Shape tiles). Of course, the base still works as a TV stand. Just make sure your TV rack is wide enough to accommodate it. Alternatively, you can wall-mount it. A trade show environment with its bright, showroom lights and many reflections (and people) is no decent space to really gauge a TV's picture quality. But the 65in TV's strong points weren't too hard to discern. The demo clips on show showed off deep blacks and rich colours - it's what we expect from an OLED screen. Reds and blues looked lush and subtly shaded, and skin tones appeared natural. The screen's 4K resolution was crisp and clear, while threads of clothes, water droplets and textured wood all looked finely detailed. Whites looked clean but not overdone, and it seemed to have a good handle on motion, too. Despite the environment, the set did a decent job of fending off all the reflections and glare, and its strong contrast still shone through. What stood out was that the TV didn't seem to have its brightness or colours turned up to 11 - which means the Philips came across looking rather natural and pleasing to the eye. The set's Ambilight, on the other hand, was amped-up, but we can imagine its immersive effect being less distracting when on a more subtle setting. OLEDs are well on the rise this year, and it looks like Philips has a strong contender in the 65POS9603. Ambilight helps set this TV apart from the competition and if that light show isn’t your cup of tea, the 6.1 soundbase - assuming it sounds good - should give you satisfying audio quality to go with that splendid 4K OLED picture. Whether it can better Sony's A1 range – currently our favourite 4K OLED – in pure performance terms, remains to be seen. The Philips 65in OLED 9 series is due in January 2018, with pricing still to be confirmed. We’ll just have to wait and see.